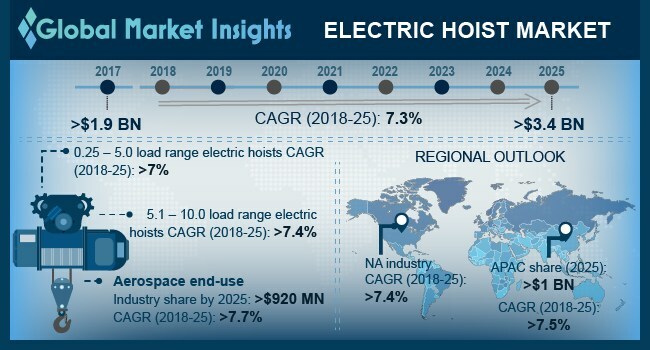 Electric Hoist Market size will exceed USD 3.4 billion by 2025; according to a new research report by Global Market Insights, Inc.
Hoist is an equipment used in material handling operations. Electric chain and wire hoist has the capability to transfer materials of heavy weights easily. The demand for electric hoists will significantly grow in the projected period due to the huge reduction in operational costs. Growth in construction activities in the developing economies is significantly driving the electric chain and wire hoist market over the forecast period. Increasing need for material transfer impacts the growth of global electric hoist market over the forecast period. Lack of expert technicians to operate the hoists and overhead cranes has become a significant factor which will restrain the growth of the market over the coming years. Wire hoists will cross USD 2.9 billion by the end of 2025, growing at a CAGR over 7.4% over the projected period. High load capacity, coupled with the capability to change the hoist specifications based on the load bearing capacities, are some of key factors responsible for the growth of global electric wire hoist market till the end of the projected period. 5.1 – 10.0 tons load bearing capacity range of electric chain hoists are expected to hold the largest share of the total chain hoist market and will cross USD 200.0 million by the end of 2025. 0.5 – 10.0 tons load bearing capacity range of electric wire hoists are predicted to have the major part of global electric wire hoist market in 2017, and this will cross USD 1.2 billion by 2025, at CAGR more than 7.3%. The electric hoist market for aerospace has the major share and will cross USD 920.0 million by 2025, at a CAGR over 7.7% till 2025. The Asia Pacific will cross over USD 1.0 billion by the end of 2025, growing at a CAGR over 7.5%. North America regional will be the second major market in terms of revenue, which will grow at a CAGR more than 7.4% till the end of the forecast period. Key companies in the global electric hoist market are Ingersoll-Rand plc, KITO Group, Beta Max Hoist, ABUS Kransysteme GmbH, SWF Krantechnik GmbH, Konecranes Oyj, Hitachi Industrial Equipment Systems Co., Ltd., and Columbus McKinnon among many others.